The Westfield River between Knightville Dam and the Huntington General Store has it all. This 5.2 mile run takes you through Class II-III rapids, drops and rock gardens with beautiful hill town scenery on the shore. It has something for paddlers of all abilities and is my favorite kayaking run. This river section makes up the first 5.2 miles of the Westfield River Race’s expert course. This run is so special because it features plenty of rapids and challenges yet it is relatively low risk; depending on water level. 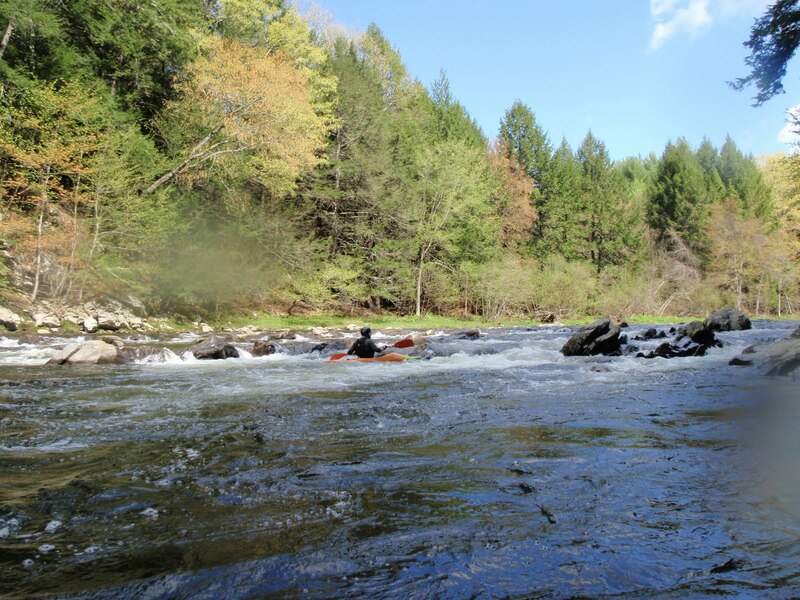 There is nothing on this run that you can’t get through by paddling and leaning down river. I should also note the scenery along the river; it is beautiful! This run takes you through a state park where you feel miles from anywhere. We put in at the base of the Knightville dam in Huntington. The water was flowing at 700ish CFS, according to American Whitewater, which is considered lower runnable. There is a log wedged in the middle of the river here but there was plenty of water and room to go around it. From here the fun starts right away with a little rapid that got the adrenaline flowing. We immediately noticed that we were barely scraping rocks and that there was enough water to have fun without getting dangerous. From there the paddling becomes a classic Westfield River run with stretches of rapids followed by brief calm sections that are great for recovery. The paddling gets even more interesting about a half mile downstream from The Rapids restaurant. This is where the river enters Gardner State Park and enters a section of rapids we refer to as “The Fingers”. Here the river breaks into three sections with a rocky run to river left, not enough flow to river right and a fast flowing chute down the center with a drop of a few feet. We kept our boats straight, planted a few good strokes and rode this roller-coaster of a rapid to the deep recover pool just beyond it. The river then enters a rock garden where it is fun to pick lines and maneuver around obstacles. There is still plenty of space to maneuver without getting into trouble. The river then makes a sharp right turn that leads to one of the river’s most famous rapids known as “The Drop” This is a plain and simple 4 foot drop with an excellent recovery pool. I picked a bad line in this rapid, leaned to compensate and accidentally took one hand off my paddle. The low water flow let me get away with this mistake. Had the water been any higher I am sure I would have gone swimming. From here nothing but choppy water stood between us and the takeout just before the bridge near the Huntington General Store. We got out of the water wanting more, which is always a great way to end a day of kayaking. May 11, 2011 in Huntington Ma, Westfield River Race, whitewater kayaking. Grant, although I'm not a paddler, your report makes it tempting to consider this sport! The scenery and remoteness are certainly appealing! Thanks for sharing. Grant – Sounds like fun. Jill and I want to take up Kayaking at some point. Probably more along the “calm waters” route, but we want to try it nonetheless. Great report and description of the river. Have you have ever tried Rapid River up on the NH/ME border in Errol? My Dad and I used to snowmobile up there along the river and recall hearing stories about the elevation drop of the river being a killer of rafting and kayaking. John – Paddling will definitely take you to remote places that you can't hiker to! Karl – Good luck with getting into paddling. It is one of those sports where you only need to buy gear once which I like. I have never heard of the Rapid River before but it sounds like it would be worth the trip to check it out. Thanks for letting me know about it! I've been looking for a place to try some kayaking. This sounds perfect. Is there any camping nearby? Any ideas for a place in New England to do an overnight kayak/canoe trip with camping? John – Paddling can be a great diversion from hiking sometimes, let me know if you ever try it! Karl – Kayaking in flat water is wicked fun to, hopefully you will get to try it soon. I have never heard of the Rapid River, but from what you describe it seems worth checking out. Andy- I think this stretch would be a great place to try kayaking but there is not much for campaign nearby. 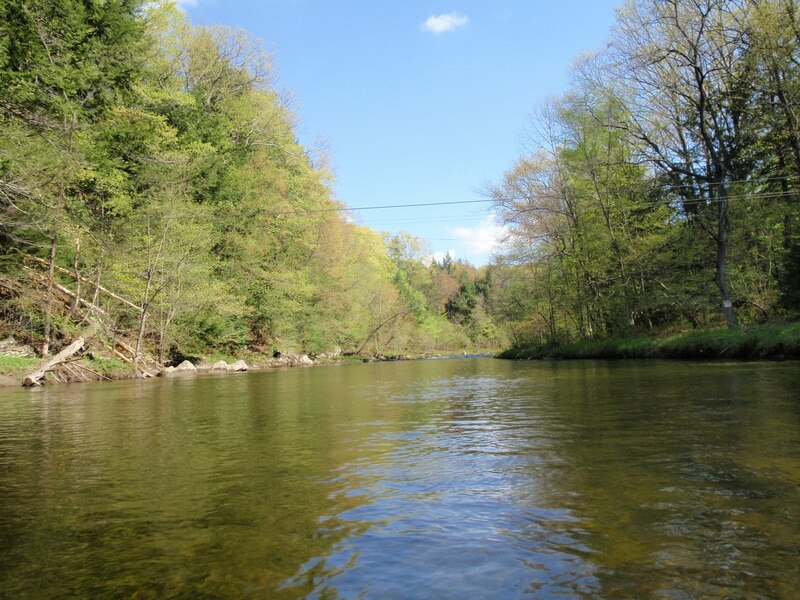 I recommend checking out the Deerfield River near Charlemont MA. ZOAR Outdoor has great camping right on the river. (http://www.zoaroutdoor.com/camp.htm) Also, the ZOAR Gap section of the river has everything a kayaker could want (http://www.zoaroutdoor.com/deerfield_ataglance.htm) . I don't mean to sound like an advertisement but ZOAR also rents boats and provides lessons if you need them. Let me know if you ever come out this way for some paddling.